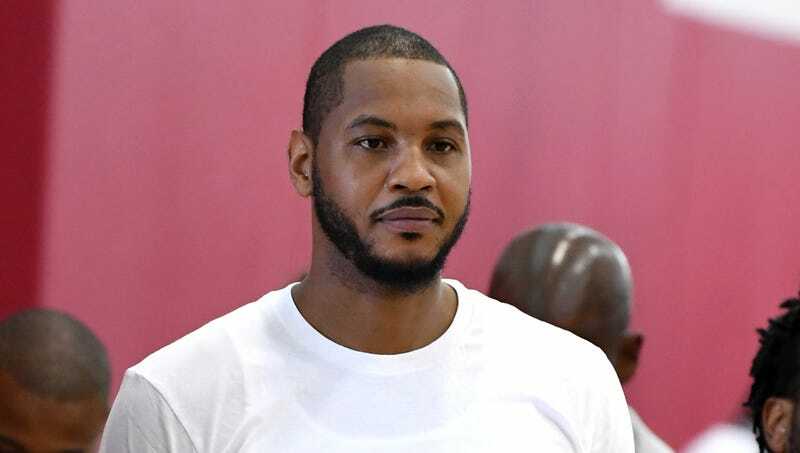 NEW YORK—In an effort to make the biggest impact possible in his 17th season, Carmelo Anthony revealed Tuesday that he thinks he would be a great fit on a team with a general manager who hasn’t been paying close attention the last few years. “The ideal situation for me would be a team that thinks they need that one last piece to become a contender and a brand-new GM who’s been out of basketball for years without really keeping up,” said Anthony, explaining that he would love to find a team run by someone who is completely out of touch with advanced statistics and has spent at least half a decade or more focused on his family and personal life rather than evaluating NBA talent. “I can definitely be a major contributor on a team where upper management is in transition and completely off their game. Someplace with a GM who knows all my strengths from five years ago and a new or unpopular coach who can take all the blame for my play would be perfect.” Anthony added that his ideal teammates would be ones that didn’t need to touch the ball to have an impact.